All transactions are safe and secure with a reliable history in online purchasing behind each of our associates. 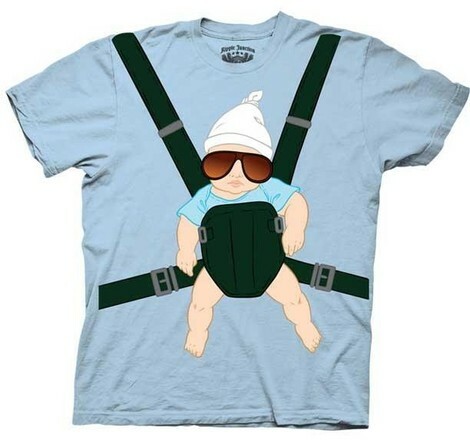 Buy the Baby Carlos Hangover t-shirt to own Hangover clothing and merchandise. Take a tip from The Hangover movie on what to do when you find a baby in the closet after a night of debauchery. After all, you can't just leave it there with a tiger in the next room. Aside from checking its collar, you should put your sunglasses on him to protect his eyes, strap him in his baby carrier so you can keep track of him, and rename him Carlos so you like him more. If you enjoyed seeing Alan toting Carlos around, then get this Alan Hangover Baby shirt to look like him. Also, check out the gallery for costume accessories like the Hangover Blublocker sunglasses they shared. In addition to the Baby Carlos Hangover tee above, browse the Hangover Clothing Gallery for more apparel like men's and women's clothes, kids shirts or hoodies.